Beer, Wine and Spirits. Tastings and Travel. News and Events. Classic Flavors from Breweries, Wineries and Distilleries Across the Drinks World. The Guardian's 10 Best Brewpubs in the U.K. According to The Guardian, an English newspaper, there are now 500 microbreweries around the United Kingdom and the trend reflects a counter balance to the much reported "death of the British pub." The Guardian recently issued a list of the top 10 U.K. brewpubs. The list has received some passionate feedback from readers. One eyeopener is there are no London brewpubs on the list. The closest is around 40 miles away. When I stop to think of trying to construct a list of the top 10 brewpubs in the U.S. it would be difficult seeing one from New York, Los Angeles or Chicago cracking that elite ranking. Piece Brewery & Pizzeria in the Windy City probably has the best credentials and wins its share of awards, but perhaps there is something about big cities and brewpubs that we share with the British. The title of world's strongest beer is now claimed by a brewer from northern Scotland. 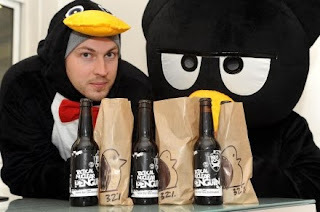 BrewDog, located in Fraserburgh along the North Sea, has released Tactical Nuclear Penguin, which the brewery says weighs in at 32 percent alcohol by volume. At a near Scotch-like 64 proof, the beer replaces Germany's Schorschbock, which is a 31 percent alcohol by volume eisbock. By way of comparison, Samuel Adams Utopias is 27 percent alcohol by volume and recognized as the strongest in the U.S.
To reach the high alcohol level the brewery stretched out the fermentation process using extremely low temperature. A 330 milliliter bottle of Tactical Nuclear Penguin will cost nearly $50. Don't worry about having to pick up a $300 six pack, since only 500 bottles have been produced. BrewDog has had a number of running battles with government regulators since coming on the scene in 2007. They have used these fights to gain valuable publicity. The newest beer is a "cynical marketing ploy" according to Alcohol Scotland. Tuesday Tasting is a regular feature of Lyke2Drink that explores some of the best beers, wines and spirits on the market. This week we taste seven unique brews from around the United States. Dogfish Head Sah'tea: The folks in Delaware must have worked a few long days coming up with the ingredients for this one. Black chai tea, rye, juniper berries, cardamom, cinnamon, ginger, cloves and black pepper. Wood-fired rocks caramelize the wort and a German weizen yeast is used in achieving a 9 percent alcohol by volume level. And somehow it all works. Cloudy gold color. The tea is clearly there and spice notes ring through. You should try this brew at least once. Duschutes The Abyss 2009 Reserve: This imperial stout has a "Best After Date" on the label, but I had to open the bottle and give it a try. This is one big, black, beautiful brew. At 11 percent alcohol by volume this beer is imposing in many ways. The beer is brewed with licorice and molasses, with a third aged in ex-Bourbon barrels. The whiskey comes through in just the right amount and there is certainly sweetness from the molasses. It would be interesting to taste this beer in a couple of years. Life & Limb: Sometimes collaboration beers don't live up to expectations. That's not the case with this 10 percent alcohol by volume beer from Sierra Nevada and Dogfish Head. A beautiful brown color and wonderful hoppy nose. Both maple and birch syrups are used, and the malt really balances out the brew overall. The yeast is a blend of house varieties from both breweries. Good dark fruit notes that mark this as a sipping beer. The brewers also released a small beer -- 5 percent abv -- from the second runnings called Limb & Life. Nogne O/Jolly Pumpkin/Stone Special Holiday Ale: A three-way collaboration that combines Michigan chestnuts, white sage from southern California and Norwegian juniper berries. Dark colored ale that has some holiday spice scents. The malts give this a nice heft and long lasting flavor profile. Pike Entire Wood Aged Stout: Pours black as night with a tan head. Dark chocolate, roasty notes wrapped around a brew with attractive vanilla and Bourbon flavors. The hops in this one don't take a back seat. A very big brew. Redhook Treblehook Barleywine: This limited edition brew pours a nice reddish brown color with a thin off white head. The dry hopping of this beer comes roaring through in the aroma and flavor, balanced by a good amount of malt. It drinks smoothly, especially for a 10.1 percent alcohol by volume beer. Widmer Brothers Reserve Cherry Oak Doppelbock: This is a new beer that is part of the new "Brothers Reserve" series. Good looking brown bock with a firm tan head. If you are looking for big fruit, this is not your beer. However, I enjoyed the subtle nature of the dark sweet and red tart cherries. More of a background note than a lead element. The oak really serves to mellow out this beer. I found it opened after a few minutes and as it warmed I detected more body than originally showed itself. There are 7,850 7-Eleven store in the U.S. and they sell $127 million in wine annually. 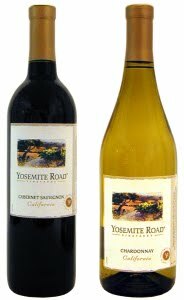 Soon they will be marketing a private label wine -- Yosemite Road -- for $3.99 a bottle. The convenience store chain plans to sell its exclusive chardonnay and cabernet sauvignon, which is made in California. Stores in the United States and Japan will carry the wine. 7-Eleven has 36,000 company owned and franchised stores in 15 countries. The company says the new wine follows the success of the 7-Select store brand launch and reflects consumer trends brought on by the economy. The wines will be made by The Wine Group in California. That company is behind the budget priced Glen Ellen and Corbett Canyon brands. When is a Beer Too Cold? Rick Lyke, a veteran drinks journalist, writes about beer, wine and spirits for a number of magazines. The first post made to this blog on July 19, 2006, contained disclosures require updating and amplification. This blog accepts beer, wine and spirit samples for review purposes. On occasion, we accept airfare and accommodations to visit a brewery, winery or distillery as part of our reporting. Often visits are made as part of other trips where we pay for the travel. Rick Lyke works for Eric Mower and Associates, a marketing communications firm. EMA clients have included North American Breweries, Diageo, Constellation Brands, Matt Brewing, Finger Lakes Wine Alliance, the Grove Park Inn and Applebee's. This is a personal blog and is not affiliated with my employer, Eric Mower and Associates. The views expressed here are my own and do not represent or contain any expression implied or otherwise from EMA. Rick Lyke is the founder of Pints for Prostates Inc., a 501(c)3 charity that reaches men through the universal language of beer. Brewers, distributors, suppliers and retailers have donated product, services and funds to support the charity’s mission. Copyright 2006-2012 Rick Lyke. Material cannot be reused without written permission. Travel theme. Powered by Blogger.